PI introduces the new H-860 high-speed hexapod system designed to accurately simulate motion with six degrees of freedom. The platform features high accuracy and bandwidth that optimizes motion and image stabilization algorithms that are used in drones and cameras, and for pinpoint accurate images. Ideal applications include vibration simulation, precision positioning, lens alignment in camera manufacturing, photonic fiber alignment, and image stabilization. The H-680 6-axis hexapod motion system has a freely definable trajectory and pivot point for increased versatility. 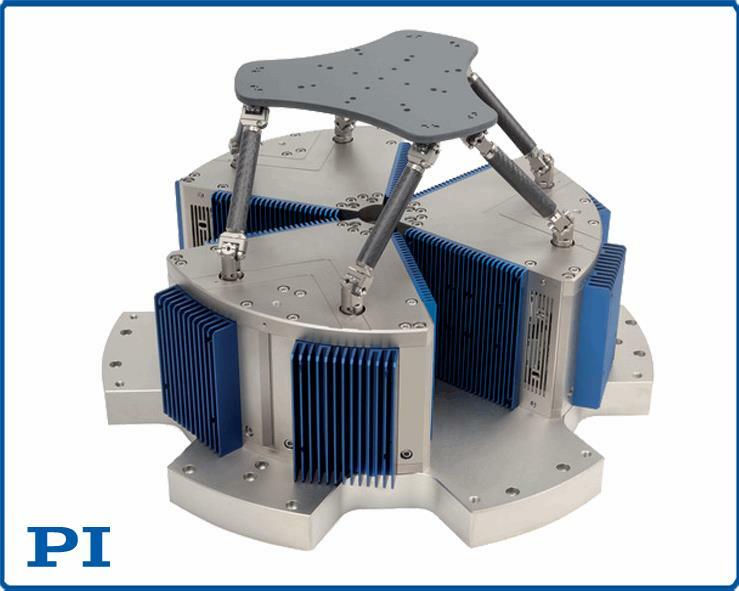 This shaker hexapod provides acceleration of 4g and velocity to 250 mm/sec– all while operating quietly. The system features an X, Y, Z travel range up to 15 mm with incremental motion of 1 µm, up to 8° in pitch, and yaw and roll (θX, θY, θZ) with 9 µrad incremental motion. The carbon fiber components are extremely stiff and light-weighted which reduces the inertia and results in a high Eigenfrequency of 200 Hz. For additional features, specifications, and product benefits, download the datasheet.